Puddings make up the most varied family of deserts with essential flavours such as, Vanilla, Chocolate, Caramel, Coffee and Pistachio, and more recipes as well… Highly innovative! “We take great pleasure in inventing original flavours“with, for example, flavours such as Rocher coco, Banana flambée, Marshmallow and even Cookie flavour, voted as the Flavour of the Year for 2016… “We don’t rule anything out, and nor do our customers! “ (Claire Guillard, in charge of Marketing and Category management). Our liégeois are made using expertise which is exclusive to Laiterie Saint-Père ! The secret of their manufacture? “We keep that to ourselves: our products regularly come out top in taste tests“. 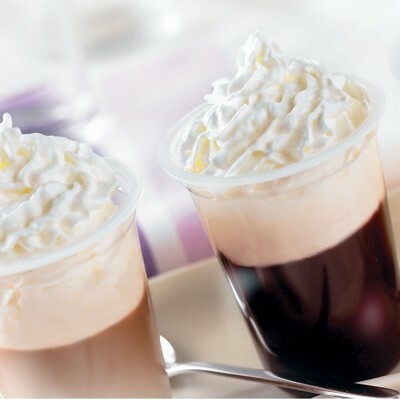 Mousses and mousses liégeoises available in two flavours: chocolate and coffee. Flans and gelled desserts make up a range of four products: creme caramel, Vanilla, Chocolate and Caramel-flavoured gelled desserts. Semolina and rice pudding come in four flavours: Natural, Vanilla, Rum and raisin and Caramel sauce. Available in packs of 100 and 115 grammes.